Bran Castle, Romania. 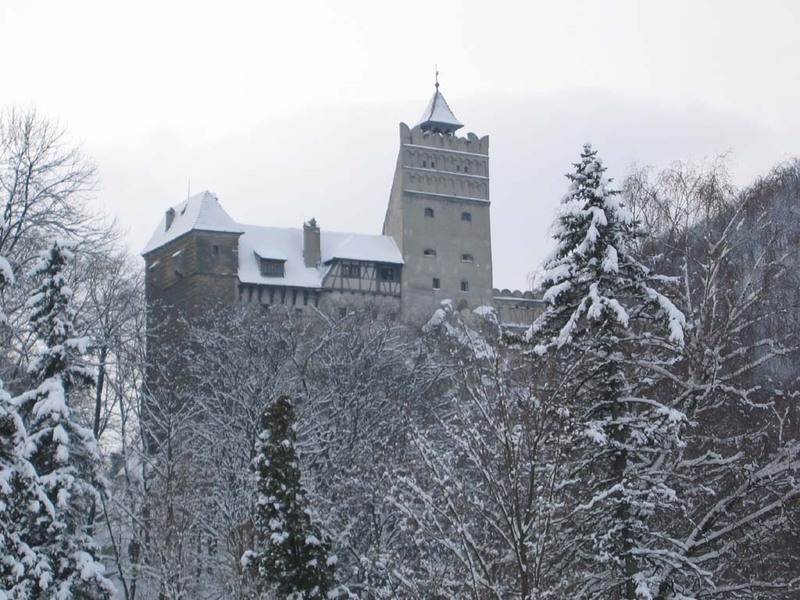 This is a fantastic example of a well-preserved mediæval castle — and one which has retained its nature as a fortification, nor having been turned into an indefensible stately home by knocking windows and things out of the walls. It's a museum open to the public now, and I'd love to have a look around it one day (though getting there from the other side of the world is a bit troublesome). Here's a google image search page jam-packed with photos of the place. Just because, wow. 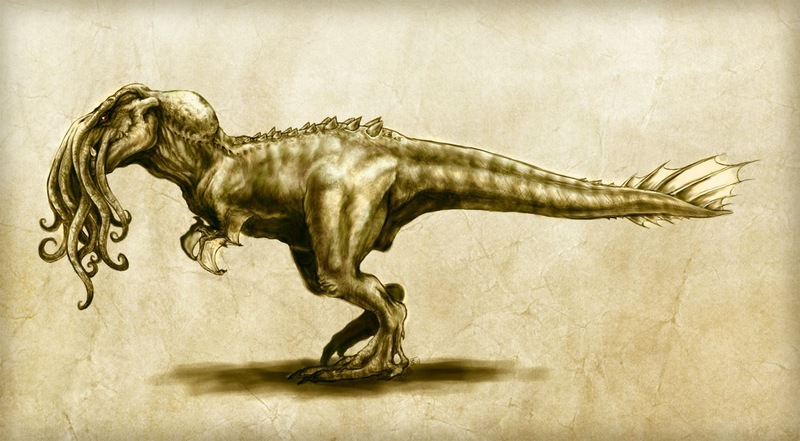 Greatest tentacle-faced dinosaur ever. I have got to find a plausible way to get this guy in amongst my party. Or even implausible. Because wow. My friend Steve recently passed on to me a troop of three old Battlefront 15mm (1/100) A9 Cruiser tanks. This model has been remastered and re-released by Battlefront, but I haven't seen any of the new ones in the flesh, so I don't know how they compare. Anyway: I've broken down the models, tidied up the castings a bit and reassembled them, replaced the white-metal 2-pounder with a turned brass one, and am painting them in the 1940 BEF disruptive scheme of Khaki Green No.3 and Dark Green No.4. I can buy a couple of troops of tanks for the price of a single 15mm one. A game requires less space to set up, or a larger game can be had in the same space. The models are easier to transport for 'away' games. The models, being so much smaller, require less painting to look acceptable, and at close range, good quality 6mm stuff (like that from GHQ) look just as good. Storage for both models and terrain is much simplified, being so much more compact than 15mm stuff. However, I'm dithering a bit. When I've sold off gaming stuff in the past, I've almost always come to regret it. Plus, selling it all is bound to be a huge hassle, and I don't actually need the money that badly. 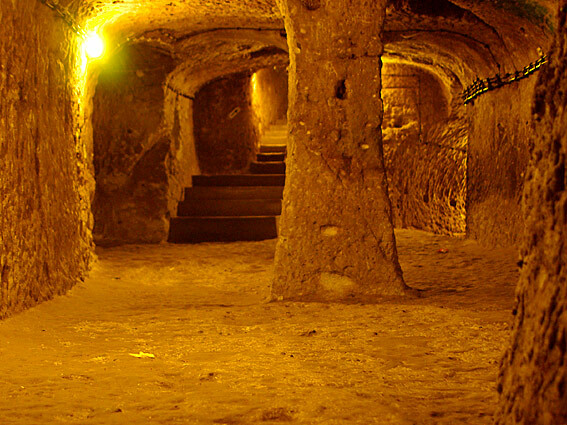 In Cappadocia (in Turkey) there are whole cities burrowed under the ground. There are lots of them — nobody is quite sure how many exactly, because they've pretty much all been abandoned and over-built, but the largest at Derinku is (I believe) open to tourists, and others may be too for all I know. Click here to jump to a google image search page full of pictures of them. Actual subterranean 'dungeon' complexes. How cool is that? When I first saw the images from the Naica caves, they just blew me away. 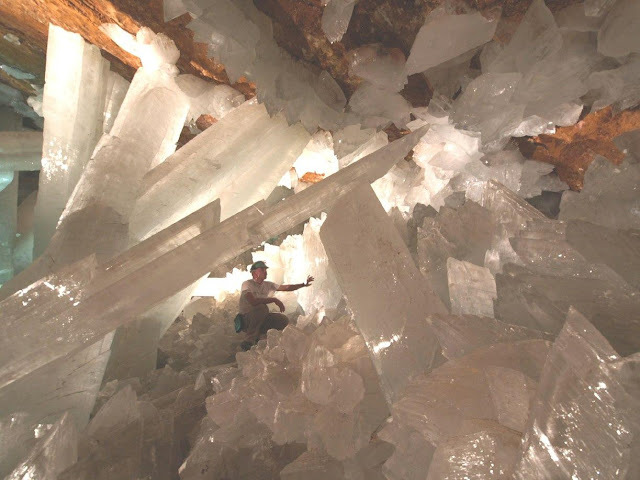 At first I thought I was looking at a close-up of the inside of a geode, and then I saw the guy sitting in among the huge crystal shards, and my mind boggled. 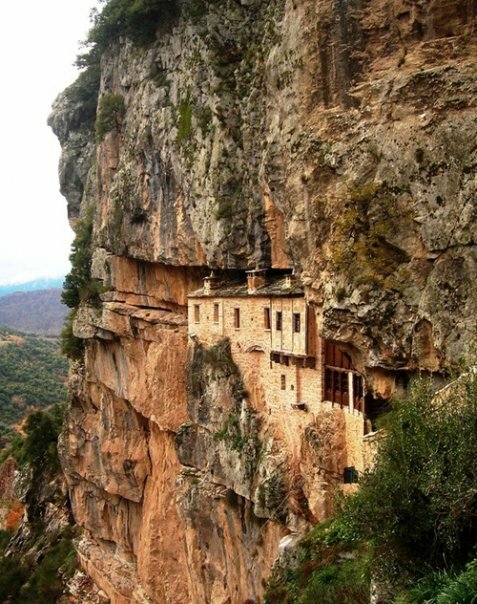 I'm not entirely sure where this structure is, or what it's for, but I suspect it's another monastic retreat. 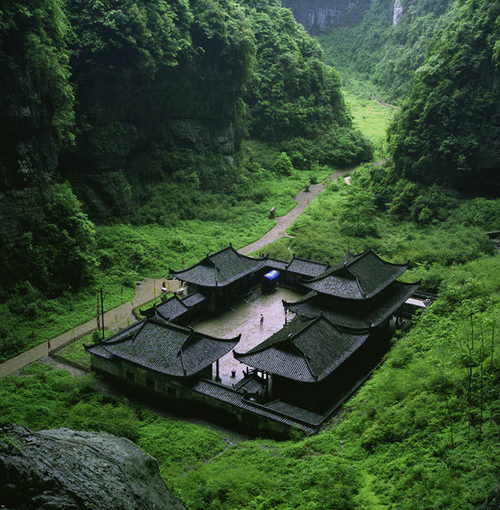 Monks seem to like living in peculiar places. I don't know about other people's campaigns, but in mine terrain has turned out to be as deadly — or more so — than any nasty monster with teeth this big. Climbing and swimming (or more accurately, the failure to climb or swim) has claimed the lives of several brave adventurers, so getting at a place as inaccessible as this is bound to raise a groan or two. A couple of potential scenarios come to mind for this scene: maybe it's a prison, from which the party have to rescue an almost insanely arrogant and touchy prince, sequestered there by an imposter who has taken his place (the Man in the Iron Mask schtick). Or maybe it's the quarters for the guards of some potentate's treasure vaults, carved into the cliffs behind them, and therefore a legitimate target for any band of adventurers of the usual low level of morality and high level of criminality. In my endless search for Gamescience precision dice, I happened upon Gamestation. They appeared to have good stocks of the dice I wanted, and though their prices were a little higher than those quoted on Zocchi's site, I thought I'd order a few sets. Until I got to the shipping section of the checkout routine. The cheapest shipping option they offered to NZ was over fifty US dollars! That's about 150% of the actual order value, and for an order which would weigh no more than a few ounces, nor amount to any great bulk. I've had orders shipped from the UK on the other side of the world for a fraction of that, and bulky book orders from the US for under $10. Those shipping rates are outrageous, and needless to say, I won't be back to Gamestation any time soon. I offer this in warning to any potential non-US customers*. I wouldn't recommend that you support Gamestation as long as they persist in this phenomenal price-gouging. * Note: I have no idea what their shipping rates are like within the US, but I wouldn't be sanguine about getting anything cheap from them. 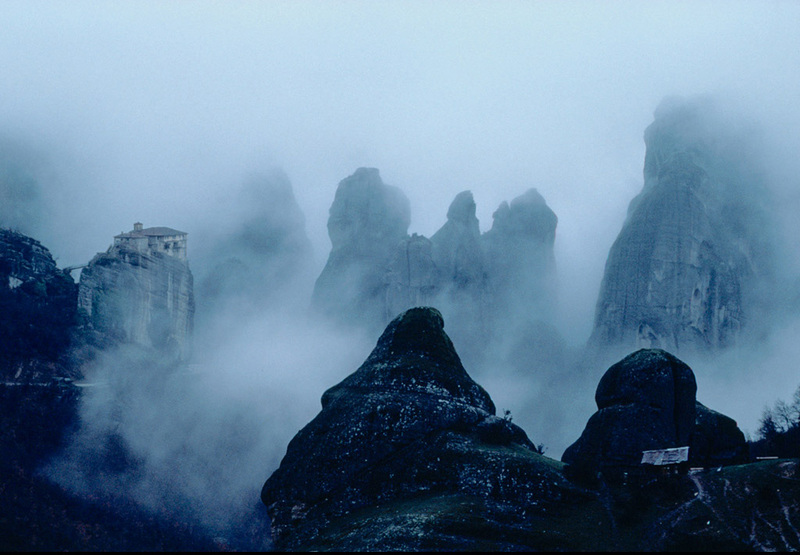 This is one of the Meteora monasteries in Greece, occupied constantly since the 9th century. It would make an ideal isolated wizard's lair or something similar; the mists and the towering sandstone crags are certainly atmospheric. The building itself is on two or three levels, and if you felt the need for more you could easily burrow down into the sandstone pinnacle on which it stands. 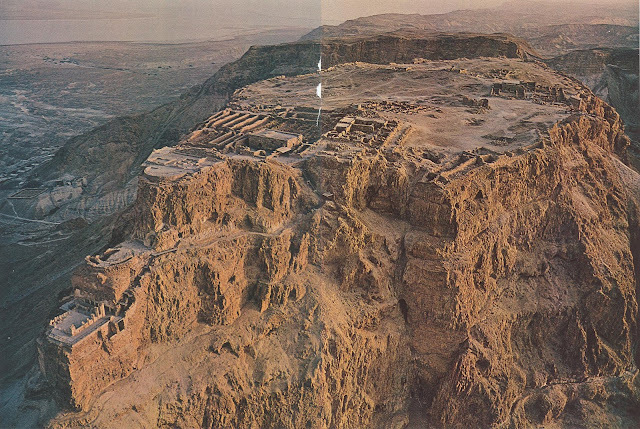 Masada was a fortified plateau, occupied and defended in the first Jewish-Roman War by Sicarii rebels. In 72AD, the Roman governor of Iudaea Lucius Flavius Silva headed the Roman legion X Fretensis and laid siege to Masada. The Roman legion surrounded Masada and built a circumvallation wall and then a siege embankment against the western face of the plateau, moving thousands of tons of stones and beaten earth to do so. Tradition holds that the garrison fired the buildings and committed mass-suicide just before the Roman assault, but archaeologists have found only 30 skeletons on the site. Anyways... the place is just perfect for the ruinous first level of a huge mega-dungeon with entrances on multiple levels. 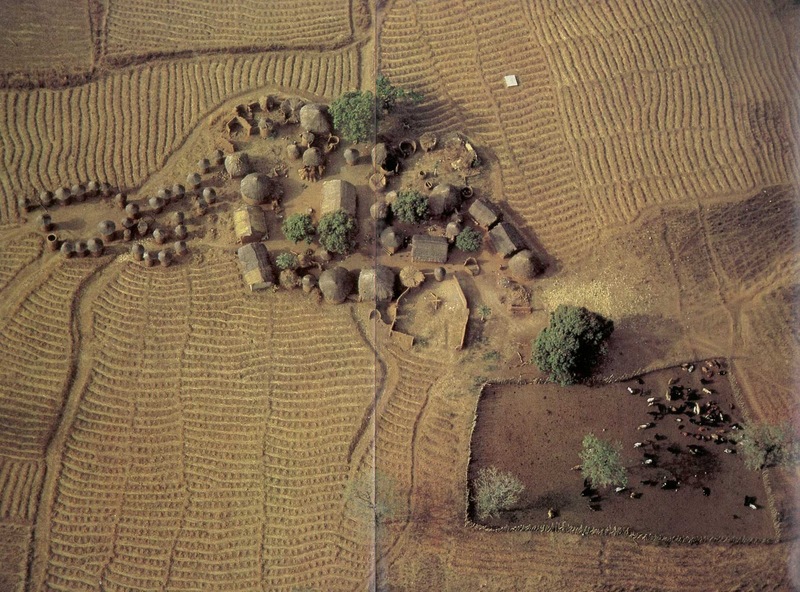 This is a Senoufo village on the Ivory Coast in Africa. The little domed things on the left are granaries, and the animals in the corral at bottom-right are cattle. I'm not 100% sure what the crops are, but I think they're likely to be millet — they eat a lot of millet in Africa. I happened on this image somewhere on the internet, and it immediately grabbed my attention because it's almost exactly the scene I was imagining in an episode of Zosia the elf's adventures I ran a few years ago. I thought I might start using this blog to collect together some of the game-useful scenery and/or artefact images I've gathered over the years. Hopefully they'll be of some use to others as well as to me. Anyway, this image: I'm not sure exactly what function this particular complex serves, or even whether it's Japanese, Chinese, Burmese or whatever (no doubt somebody with more knowledge of Asian architecture could tell at a glance). I would use it as a roadside inn and/or bath-house. When any creature is brought to 0 hit points (optionally as low as -3 hit points if from the same blow which brought the total to 0), it is unconscious. In each of the next succeeding rounds 1 additional (negative) point will be lost until -10 is reached and the creature dies. Such loss and death are caused from bleeding, shock, convulsions, non-respiration, and similar causes. It ceases immediately on any round a friendly creature administers aid to the unconscious one. Aid consists of binding wounds, starting respiration, administering a draught (spirits, healing potion, etc. ), or otherwise doing whatever is necessary to restore life. Any character brought to 0 (or fewer) hit points and then revived will remain in a coma for 1-6 turns. Thereafter, he or she must rest for a full week, minimum. He or she will be incapable of any activity other than that necessary to move slowly to a place of rest and eat and sleep when there. The character cannot attack, defend, cast spells, use magic devices, carry burdens, run, study, research, or do anything else. This is true even if cure spells and/or healing potions are given to him or her, although if a heal spell is bestowed the prohibition no longer applies. I confess that I had never read this passage until it was revealed to me in this thread on the K&K boards, and we've therefore never played it that way. When cured back up over 0hp, our characters have been up and about, just as spry as ever and raring to go. If I were going to create a revivication spell usable at lower levels than Heal, I'd probably give it a down-side. I'd have it knock off, say, 1d4 years off the character's life-span due to the stress of being forced back into wakeful usefulness after having been so badly traumatized. That wouldn't have much immediate impact (none at all in a one-shot session), and it would allow the character to get back into the fray in short order, but it would have a cumulative effect over the course of a campaign that would make it an emergency measure rather than standard practice. Players would have to think twice about whether they want to accept an inevitable early decrepitude in return for immediate gratification. A new and most enjoyable (nominally) quarterly PDF fanzine has appeared over the last year by the name of Encounter, edited and laid out by Jesse Walker. It's up to 3 issues so far, the most recent having been published in September 2010; apparently the 4th issue has been delayed owing to various real-life hiccups, but is on its way. The tagline is "A fanzine dedicated to the classic D&D Game! ", and the content is thus compatible with games like Labyrinth Lord, Swords & Wizardry, OSRIC and so forth as well as D&D. Each issue is short compared to some other gaming magazines; just 28 pages each, including the covers. But they're 28 quality pages, easy on the eye and full of good nutritious meat. The layout is clean and professional, the cover graphics (see above) are both evocative and of good quality, and interior illustration is a mix of public domain art and some decent images by Jesse Walker and others. The content presented thus far has been both entertaining and useful, and I'm looking forward to seeing what's in store in issue #4. Personally, I'd like to see the format extended to 32 pages and the font size enlarged a bit, but that's because I print them at digest-size so everything is shrunk down from the original size. Encounter is available free to download from www.encountermagazine.au2.com, and if you have even the slightest interest in old-school D&D-style gaming, I recommend it highly. 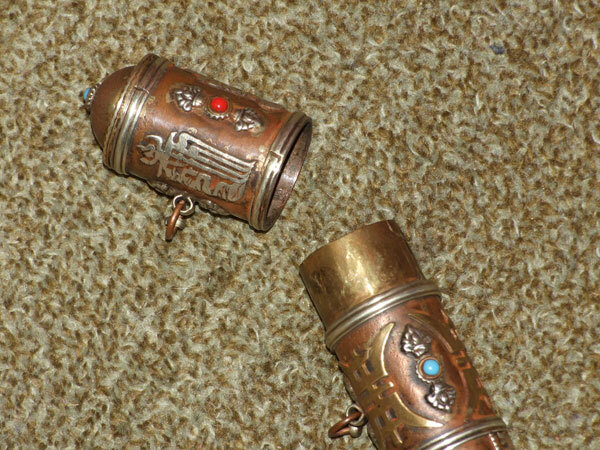 Here's a little something that hopefully might add something to the visualization of our games — a real-life genuine scroll-tube. My partner, Annette, picked it up recently from an antique shop up in the Wairarapa. This one is Tibetan I think, probably intended to hold a prayer-scroll; it's not all that old, not more than a couple of hundred years at most, but it's basically the same as similar things that have been made and used forever. 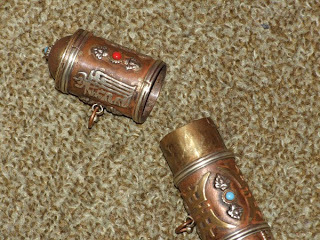 It's made primarily of copper, with applied decoration and script in brass and silver and beads of semi-precious stones. The base is flat, and the tube stands up reasonably steadily; the top of the cap is domed. There are chain-loops on each section, and I suppose that it would have had a chain joining the two halves so that you wouldn't risk losing the cap. The tube is in two parts that fit quite snugly together. There is no locking mechanism, but if one wanted to secure the lid, or make the tube air- and water-proof, one could apply pitch or wax to the collar to do the job. Just as it is, it would be pretty weather-proof though.